Available at last; the first Tandra Picture Fiction Experience Ink-on-Paper Edition in full Spectrum-Colour you can actually hold in your hands as you read. “Titian, The World Builder,” is a twenty-four page book (including an extra strength cover) in full Spectrum-Colour you can read in your hands without use of a computer monitor. You can read this book by sunlight (or even by candle-light if you wish), no electrical current required. In fact, you can read it by light bulb if you wish. The choice is yours. You can read this book any place and at any time because it is a real physical book you can take with you wherever you go. You can tell we are excited by this new Tandra Picture Fiction Experience Ink-on-Paper Edition because we have always thought of Tandra as a full colour experience. Unfortunately, we were limited to single colour publishing back in the day when we printed on paper. When the Internet became available, we were excited to have Tandra made available at last as we have always imagined it in our head. But, while computers are nice, we are essentially print people. We like books we can hold in our hands. Picture stories on computer monitors are visually rewarding, but we prefer real books, and so do many of our readers. Now the first Tandra Picture Fiction Experience Ink-on-Paper Edition is in stock and available for immediate shipping! The story; “Titian, The World Builder,” presents an eleven page story that tells of Titian, a daughter of culture, wealth and power who caused to be constructed a planet size star ship for the purpose of removing her people from the reach of a terrible enemy that could neither be defeated nor destroyed and of the supreme price she paid for her act of heroism. The planet size star ship that Titian caused to be constructed was Tandra. The second tale, a six page narrative, tells the story of the ancient empire called Anglia when Anglia ruled all of the surface of Tandra, when Anglia was Tandra. This Picture Fiction Experience relates the decline and fall of Anglia into hostile and warring city states, it reveals the construction of the Wizard Ring, a gigantic orbiting space station that completely encircled the world of Tandra and unveils the secrets of the race of superior beings who ruled the Dread Wizard Ring and who plot to conquer and rule the surface peoples for their own purpose. With the story of the Decline and Fall of the Empire of Anglia, you will come to understand the rich history of Tandra as it was when Earthian David Galon first climbed through the Star Door to set foot on this complex and exotic alien world of fell creatures, masters of evil and savage half-naked queens. Don’t delay. Order your copy now for this deluxe full Spectrum-Colour Picture Fiction Experience. The price of $27.00 includes shipping cost and packaging in sturdy cardboard mailer. Satisfaction guaranteed! This is the first Tandra Picture Fiction Experience Ink-on-Paper Edition. There will be others! You can order by clicking on the Add to Cart button in the bottom right corner of this page for a secure link to pay by credit card or, if you prefer to order without using a credit card, you can send an E-mail to [email protected] and ask for your copy of Titian, The World Builder, or you can simply pick up the phone and call toll free 1-800-634-4050 to request your copy of Titian, The World Builder, today. We will include an invoice with your order and you can pay by return mail. If you prefer to order by snail mail, send your request along with check or money order to; HANTHERCRAFT PUBLICATIONS, P. O. BOX 719, CORINTH MS 38835-0719. That’s all there is to it! Remember the cost of $27.00 includes shipping and handling. 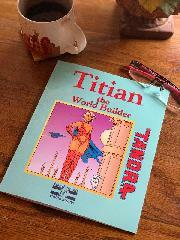 Request your copy of Titian, The World Builder, by using whichever procedure you prefer, but do it now!